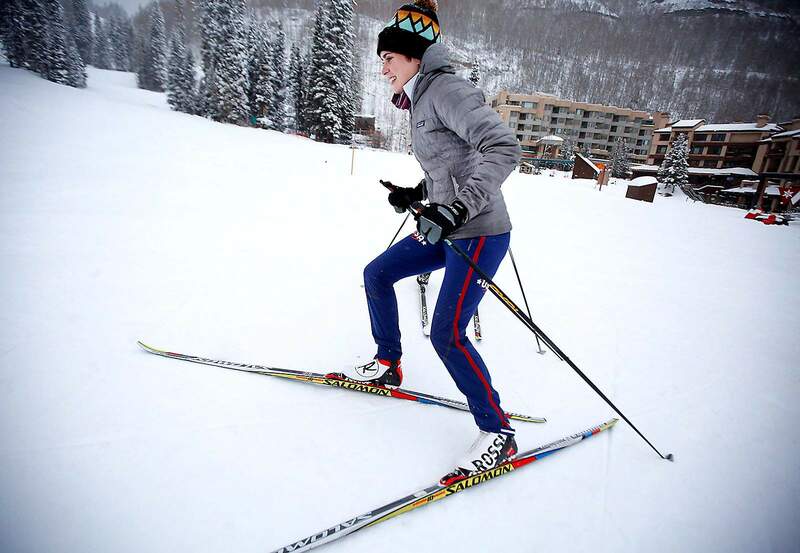 Paige Elliott, a development coach with U.S. Paralympic Nordic Skiing, at training on Wednesday at Purgatory Resort. Paige Elliott, left, races Ruth Holcomb, 15, on Wednesday at Purgatory Resort during practice. Holcomb starting training with Elliott when she was 10. “She is really inspiring and always made it super fun,” Holcomb said of Elliott. 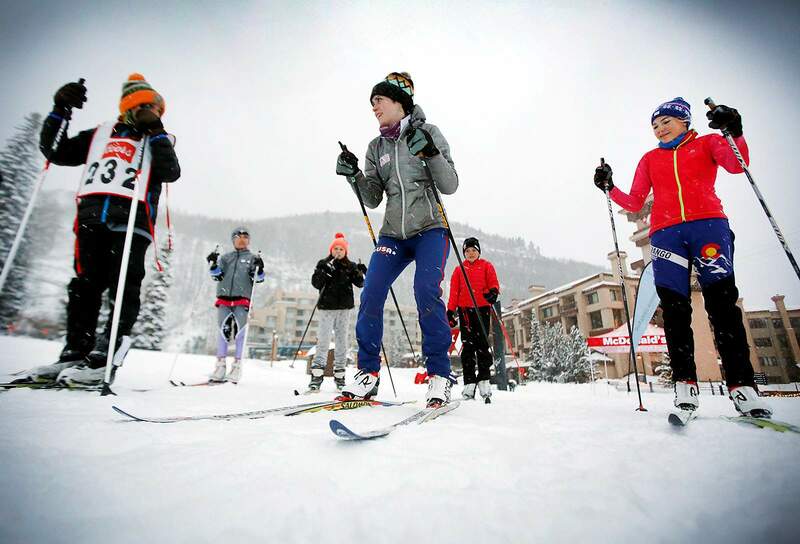 Paige Elliott, center, instructs some of her Durango Nordic Ski Club members, Andre Craig, 11, left, and Ruth Holcomb, 15, on Wednesday at Purgatory Resort during practice. Paige Elliott races around Zoe Freeman, 12, on Wednesday at Purgatory Resort while doing drills. Paige Elliott races with her club members on Wednesday at Purgatory Resort. When Paige Elliott graduated from Dartmouth College in 2013, a top ski school, she was burnt out on skiing and had no plans to start coaching. Now, she is a development coach for U.S. Paralympic Nordic Skiing, after being hired temporarily as a coach during the 2018 Paralympics in PyeongChang, South Korea. “I got thrown in at the height of competition,” she said. She was hired to test waxed skis to see how they performed and how the snow conditions were changing at the games, she said. Elliott, 27, also brought a fresh set of eyes to the team and was eager to learn, even though she was only initially hired to work the 2½ weeks of the games, said U.S. Paralympic Head Biathlon Coach Gary Colliander. Colliander invited Elloitt to join the Paralympics staff after working with her at Durango Nordic Skiing. Her attentive observations during the games led to a part-time position focused on getting new athletes involved in para-Nordic skiing at camps and other events. The Paralympics got their start in Great Britain after World War II. On the opening day of the 1948 Olympic Games in London, a spinal doctor held the first competition for wheelchair athletes called the Stoke Mandeville Games. During the games, 16 athletes competed in archery. The first winter Paralympics Games were held in 1976 in Sweden. During the 2018 Paralympics, 567 athletes competed in 80 medal events. Recruiting for the Paralympic team is a challenging task because after someone experiences a major injury, such as paralysis, getting involved in sports may not be on their mind at first, Colliander said. Recruiting relies, in part, on word of mouth and clubs that offer specialized programing for disabled athletes, he said. The athletes Paralympic staff recruit typically compete in three different categories: One for the visually impaired; standing skiing, for those with upper body disabilities; and sit-skiing, for those with lower-body disabilities. Elliott has mostly been involved with sit-skiing and has tried it herself. The sport requires athletes to push themselves forward with their poles and it is exhausting, she said. One of the lessons Colliander learned early on working with Paralympic athletes is they really do not need help with everyday tasks because they are well adapted, he said. “I have a hard time keeping up with them sometimes. ... It’s a pretty amazing level of athleticism,” he said. For Elliott, skiing, racing and outdoor pursuits have always been a part of her life, but working with para-athletes has given her a new perspective on it. “You take a sport that’s hard and make it that much harder,” she said. At recruitment events, Elliott works with athletes who are sit-skiing for the first time and helps them learn to use the gear and to maneuver, she said. Elliott grew up Nordic and downhill skiing as the daughter of three-time Olympic skier Mike Elliott, but she never felt pressured to succeed. “Our parents did a very good job raising us to enjoy it rather than only focus on winning,” she said. Elliott said she is not as competitive as some of the other racers in her sphere. For example, her brother Tad Elliott was a professional Nordic racer for 12 years, but she said she doesn’t believe she is cut out to be a professional athlete. In 2013 when she returned to Durango for the winter after spending years training with the college ski team at Dartmouth, she was a little burnt out on training and racing. 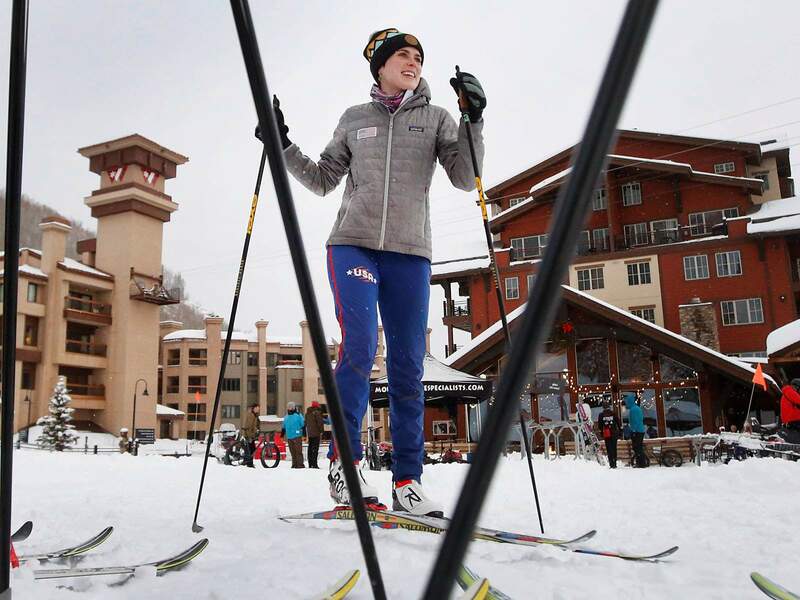 Elliot fell in love with the sport again after Colliander invited her to help coach the Durango Nordic Ski Club a few days a week, in part because of energy and excitement of the young athletes. She also started competing again in local races. Over the next few years, she took on more and more coaching responsibility and during the 2016-17 season she took over as head coach, overseeing about 50 to 60 athletes. One of Elliott’s Durango Nordic athletes was Ruth Holcomb, who started training under Elliott at the Durango Ski Club when she was 10. She found Elliott to be a kind coach who planned games, such as relay races, to help athletes push themselves, even when they didn’t really want to. “She would trick us into doing the hard stuff,” said Holcomb, a sophomore at Durango High School. Elliott was also well liked by the young athletes, and during one car trip, Holcomb said, the entire team decided to toast Elliott – after every sip of their hot chocolate. Elliot’s boyfriend, Dakota Jones, a professional ultramarathon runner, said it’s Elliott’s ability to empathize and connect with people that makes her a good coach. “(She) tries to put herself in other people’s shoes, to think about what they’re feeling and what they are thinking,” he said. Jones described her as both a great athlete and a contemplative artist. Sewing is one of Elliott’s passions in life and she loves to find vintage material such as tablecloths and bed sheets and turn them into clothing, she said. “It’s really exciting to make something that didn’t exist before with your own hands,” she said. 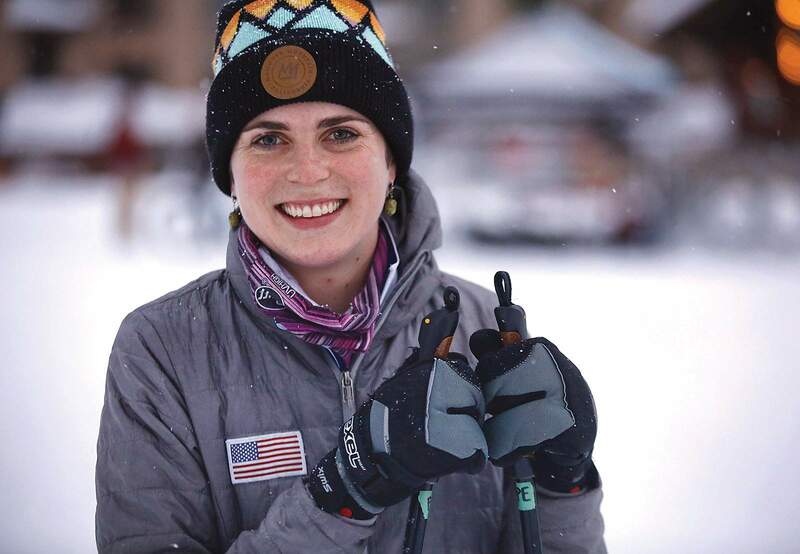 This year, she said she hopes to start selling her creations online, keep competing in local Nordic races and perhaps win at the Alley Loop in Crested Butte.